Ah,supercars. They truly belong in a world of their own. They command respect and admiration from every car enthusiast,and for most guys they are just one of those things that you simply cannot have. But we do have our own little dreams,and if dreaming about superfast cars is your thing,so be it. The Pagani legacy has been re-defined by its latest offering,the 2011 Pagani Huayra (pronounced why-eera). In a world dominated by legendary vehicles such as Ferrari,Lamborghini,Aston Martin,Bugatti,and Porsche,the name Pagani may seem obscure. But for connoisseurs who appreciate revolutionary designs and heart-stopping performance from a supercar then Pagani certainly belongs to the top of the supercars hierarchy. 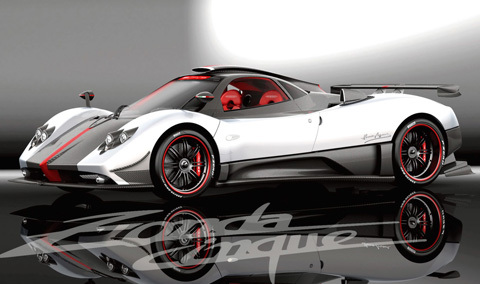 There is no doubt that Zonda is the model that made Pagani into the company that it is today. Car enthusiasts and newsmen from around the world hailed its aggressive and never-seen-before aerodynamic design. It was so successful that it gave birth to rarities like the Cinque and the Zonda F.
All that hoopla is nothing compared to the groundbreaking entrance of the Huayra,as some say that while the Zonda was evolutionary,the Huayra is revolutionary. Just like the Zonda,the Huayra is also named after a South American wind. So it is not surprising that aerodynamics play a key role in the Huayra’s design and engineering. Yes,the Huayra will replace the remarkable Zonda and we will see why the Huayra is deserving of all the hype. Pagani partnered with the engine gods at Mercedes Benz AMG in building the Huayra’s unique twin turbocharged 6.0L V12 engine. The result is a peak output of 700hp at a low 5,000 rpm generating a behemoth 811 lb-ft torque at just 3,500 rpm. That burst of power comes careening to the rear wheels through an X-trac seven-speed sequential transmission while still maintaining a pollution-friendly carbon emission. This makes the Huayra Euro 5 compliant. Providing stopping power to all that raging speed are special rear air brakes made from high-tech carbon-titanium material. The Pagani Huayra has a carbon-titanium shell making for a light supercar at in the vicinity of 2700 pounds. Being a true blue Zonda offspring,Huayra still features gull-wing doors as those found in the Mercedes SLS. But unlike the Zonda,the cumbersome wing at the rear is taken out and the rectangular horizontal tail lights have been taken down in favor of circular tail lights positioned at a higher level. Huayra now also features different grilles. Despite being built like a powerhouse machine,the Huayra does not scrimp on luxury when it comes to its interior amenities. The craftsmanship and materials used in its cabin is simply breath taking. Plush leather,aluminum and glass trimmings,and a multi-function steering wheel that allows the driver to cruise at break neck speeds without taking his hands off the wheel- these luxurious offerings all contribute to making the Huayra look like a masterpiece in every way. Huayra’s piece de resistance is its high-definition multimedia system that features a central touch screen. This touch screen allows the driver to control all important controls of the car such as audio adjustments,Bluetooth control,and satellite navigation. Only 20 Pagani Huayra’s will be available for sale each year at a cost of $1.3M. It will also be available for sale in the U.S. which is good news as Paganis were previously unavailable in the U.S.